We sunk in the fresh, fluffy snow as we snowshoed through this massive meadow. My friends, Brian and Erin, kindly shared their condo in Winter Park with me this weekend. I felt so fortunate to be able to head to the mountains Friday afternoon and miss the Saturday morning ski traffic. What a luxury they afforded me! On top of including me in their weekly winter trek to the mountains, as I don’t ski, they graciously joined me in snow shoeing on one of the biggest powder days of the lackluster snow season. Saturday morning we geared up, stepped out of the condo, and wondered what in the heck we were doing. Wind whipped tiny flecks of snow into our faces as we shoved our packs and shoes into the trunk of their convertible Audi complete with snow tires! Brian drove us 45 minutes to the outskirts of Rocky Mountain National Park where we found the trailhead to Shadow Mountain Shore. I had the greatest birthday! I started the day with a hike in Rocky Mountain National Park. Tanya and Diana met me at my house, and we carpooled to Lumpy Ridge Trailhead where we arrived to the parking area around 10am. While I think all of us have a park pass, this area isn’t near the main entrance of the park doesn’t actually require one. Since it was April and Thursday, the trail wasn’t too busy either. Another added bonus, a week after a massive snow storm the south facing slope was snow free, so we actually got to hike rather than snowshoe. We started gaining a decent amount of elevation as we climbed a stairstep trail surrounded by large granite boulders and unique rock formations. Being the beginning of the hiking season, we took a few opportunities to catch our breath while enjoying the view. We worked up a sweat quickly and shed layers down to short sleeves in the sunny fifty degree weather before we even reached Gem Lake, located 1.8 miles into our 7.8 mile roundtrip. After admiring the lake tucked beneath the cliffs, we carried on to the trail junction where we turned left. The trail leveled off as we crossed over the ridge and walked through some open space before entering the forest. The trail narrowed as we descended through the pines. 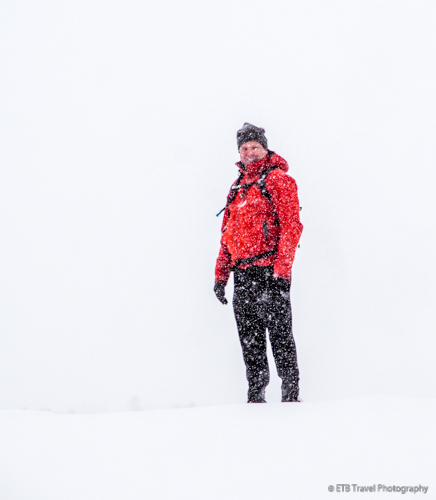 Occasionally, we had to walk carefully through some snowy areas or take short detour, but for the most part we stayed on the undulating path. Eventually we reached another ridge and expected to see “Balanced Rock” at the top which we didn’t immediately spot. We descended again, and there it was on the right side of the trail. It was a lovely spot for lunch slightly out of the wind. As we snacked on fruit, nuts, sandwiches and some birthday bundt cake, the clouds hid the sun and we were soon in our puffy jackets that once again we stripped off as we climbed back up the ridge! It was nice to see a few wildflowers and just listen to the chirps of chipmunks and birds with spring on its way. We even spotted a bunny at the very end! We finished up our 7.8 miles around 2pm, and I got home just a few hours before our family went for dinner. We tried Bones, an asian fusion restaurant, that was very nice. David spoiled me with a chocolate cake and wonderful gifts before we headed out to meet friends for drinks. For notecards or key chains, visit www.notablenotecards.com or www.etsy.com/shop/nichenotecards. My friend Jim organized another snowshoe in Rocky Mountain National Park. He does so about every other week, and it is nice to be able to tag along. Our group of five met at the visitor’s center before entering the park around 8:30am. We were in the parking area and walking down the road to the trailhead around 9am. My friend Tanya and her son August plan on a backpacking trip along the Colorado Trail later this summer. As such, she they have been planning some long hikes. Fortunately, my friend Diana and I got to tag along and go to Rocky Mountain National Park for a ten mile hike to Finch Lake. Finch Lake is located in a less populated area of the park. The location coupled with the fact we went on weekday made it a perfect day for trail to ourselves most the way. The trail, supported by a rock wall, immediately ascended along the side of the mountain as it wended past lichen covered boulders situated beneath the cover of evergreens. As we continued, we broke into more open spaces blanketed in wildflowers with views of Long’s Peak, one Colorado’s many 14ers. We walked at quick clip while stepping over countless rocks like we were climbing up a dry waterfall, we crossed the creek, and soon arrived at Finch Lake a few hours after our 10 am start. The forecast called for afternoon storms which wasn’t a surprise since I think it has rained every afternoon all summer! Clouds accumulated as we snacked on lunch while sitting lakeside with a view of snow-capped mountains. Soon we heard claps of thunder in the distance. It was time to descend, even faster than we ascended, with the exception of stopping to dip our heads in the creek and watch the bunnies hop away. Yesterday, it snowed six inches in Denver, and today was forecasted to be sunny in the high 50’s. “A perfect day to snowshoe”, I thought. 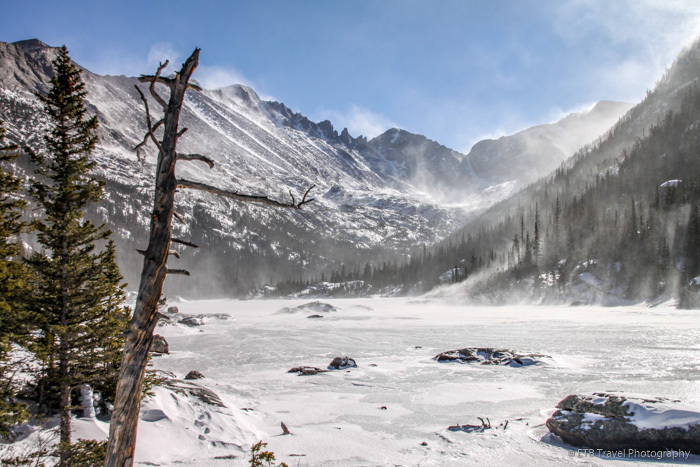 I have been longing to visit Rocky Mountain National Park in the winter time, so off I went. Going to the park is an all day event. Due to the floods last fall, certain roads are still under construction. Once I arrived in Lyon, I was greeted with a detour sign as the main road was closed. The Highway 7 detour, however, was gorgeous. 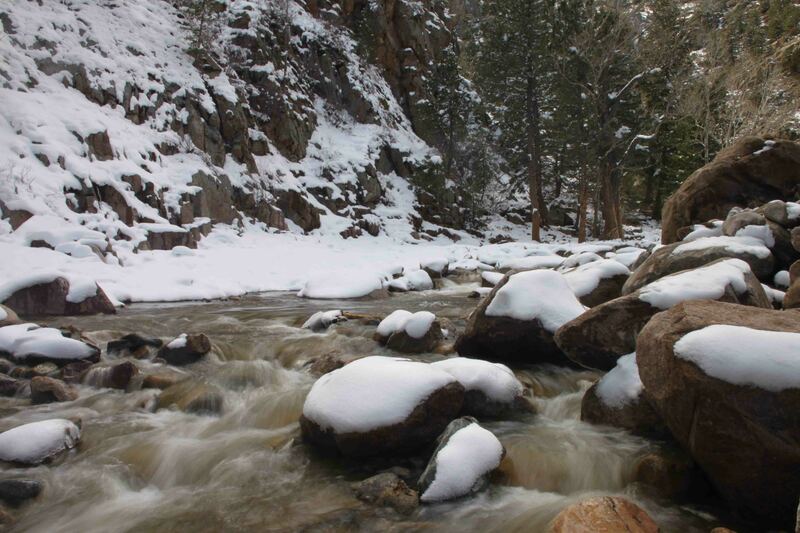 It took me through St. Vrain Canyon where rocky hills towered over the babbling brook which just six months ago was a raging river out of its banks. The recent snow lightly blanketed the landscape of evergreens, a pleasant view as I wound through the S turns on my way to the park entrance. The $20 entry fee for four hours in the park was a bit steep, but worth it nonetheless because I wanted to go! It would have been nice to share the expense with fellow hikers, but I don’t know too many people with Friday off, so I ventured out on my own. 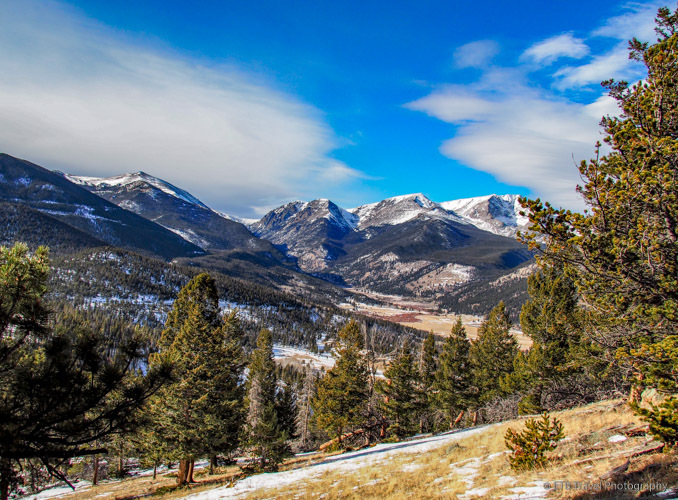 My visit brought back memories of my three days at the park during my trip around the USA…great hikes, awesome campground, amazing elk, and a tense drive across Trail Ridge Road! 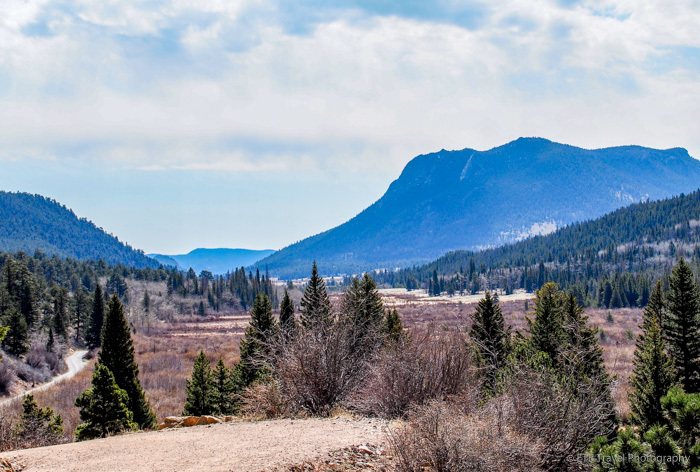 Today, I wanted to hike in a different part of the park as three days wasn’t nearly enough time to cover all the terrain, so instead of visiting the popular Bear Lake area, I took the advice of the RMNP paper and hiked a featured trail called Cub Lake. I wanted to hike six miles and this trail was 4.6 miles roundtrip. By looking at the map, I could connect to Fern Lake Trail to add some distance. So, just after the Beaver Meadows Entrance Station, I turned left and then took the first right toward the Moraine Campground. I found the Cub Lake Trailhead shortly after turning onto a dirt road. 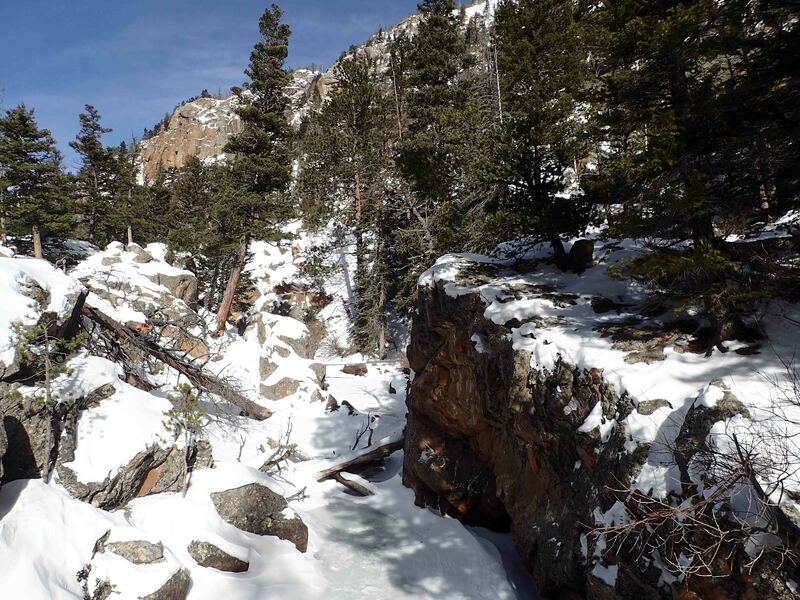 The trail began in a valley, crossed a creek immediately and gradually increased in elevation. While the trail through the meadow was snow-free, I strapped my snowshoes and micro-spikes to my pack just in case. After all, we had a decent snowfall yesterday. For the first mile or so, I stepped around mud puddles, ice patches and around a few rocks as I listened to the robins chip, watched the geese peck for food, and admired a mallard and it’s mate sunning on a rock near a marshy area. Eventually I reach tree cover where the snow was protected from the sun and it was time to fish out my micro-spikes. 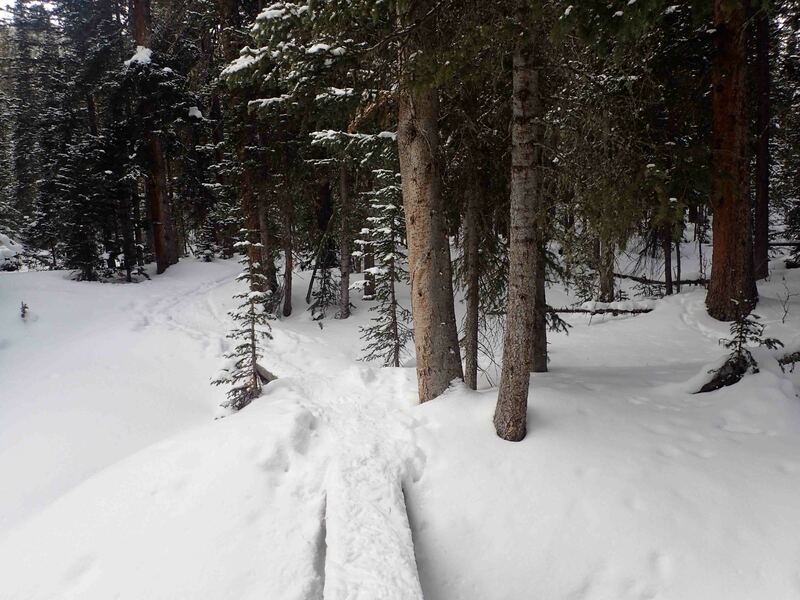 I strapped them on and made new tracks in the pristine snow on the sometimes indiscernible trail. I was thankful to find a track (usually a post hole) from a traveler on a previous day as it helped me find my way. I “post-holed” a few times myself, once conveniently when I had removed my glove to snap a photo and after losing my balance my hand ended up icy-cold. As I picked my way through the fresh snow, I came upon an aspen grove part of which was previously burned. As I understand it, an aspen grove is one tree as the roots are all connected. It was interesting to see one Aspen burned and another unaffected right next to each other. It also appeared like the elk liked to rub there antlers against the burned trees as the burnt bark was rubbed off in many places bearing a light inner skin. It took me 1.5 hours to get the lake. I don’t know what was taking me so long as it didn’t seem terribly steep with only 540 of elevation gain. Perhaps it was due to breaking the trail or perhaps it was due to enjoying the beauty around me…though I just felt slightly sluggish. 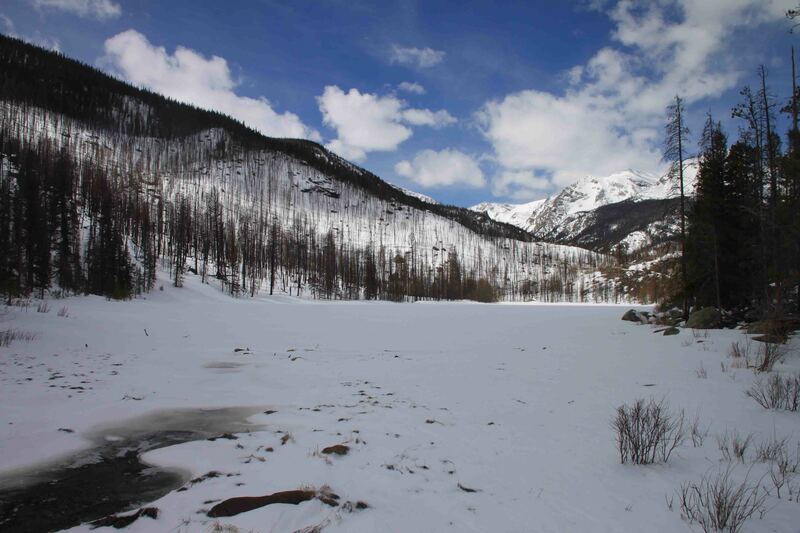 The lake was snow covered and it was difficult to differentiate between land and water. Being by myself, I decided to stop for lunch at the lake versus blazing more of the trail and mistakenly falling in! Just when I was finishing my peanut butter sandwich a family of three showed a bit winded as well. They thanked me for hiking first as my tracks kept them from getting lost! The wind picked up and I started getting chilled, so I said my farewells and headed back down toward my car. I came across a few more hikers along the way, not too many and as one moved over to the side, he “post-holed”. With a smile he remarked, “Just cooling my feet.” I’ll have to remember that! While I didn’t spot anymore wildlife on the trail, I spotted a herd of at least 30 elk in the meadow between the campground and the trailhead. What a treat! Most of them were resting, but one was grazing and a few jumped to their feet as cars stopped along the road. I love seeing animals in the wild. On my drive back, I saw three more small herds. I suppose they waited for temperature to warm up before they came out to play!